It is impossible to imagine major industries without steel – whether it be in equipment and machine building, bridge and steel construction, energy and environmental technology, transport and traffic or in the packaging industry. As a rule, the main constituents of this versatile material are always iron and carbon, iron being the major component compared with all others. Today, there are more than 2,000 types of steel which, depending on their use, have special properties regarding their strength, corrosion behaviour, malleability or suitability for welding. These properties can be specifically changed – for example by alloying, heat treatment or forming. One of the largest steel producers in India manufactures the material in high quality and matches it exactly to its customers’ requirements. But that is not all that is needed to compete in this hotly contested market. Economic production is indispensable. One weakness was the 600 m long and two meter wide conveyor belts which transport the iron ore to the furnace at a speed of 2.2 m/s. 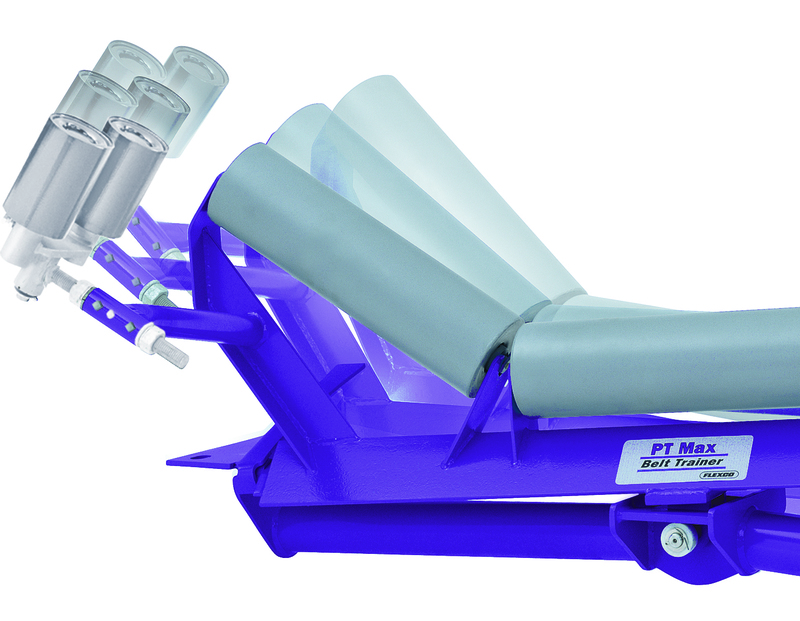 Flexco’s PT Max Belt Trainer: With its special pivot and tilt movement, if the belt wanders, the centring unit immediately guides it back into the correct position. The material exists in different forms – for example, as lumps of ore. These are naturally mined mineral mixes with large granularity. In addition to this, there are very fine granular ores. These are appropriately prepared and enriched in the pits to increase the iron content. They are only formed into lumps by pelletising and sintering. The belts also carry auxiliary materials such as quartz, limestone and anthracite. This repeatedly led to considerable material losses and the belts wore very quickly. The service personnel had to frequently service them and, depending on the condition, replace them prematurely. This was expensive and production would come to a halt, something which was unacceptable for the steel producer in the long term. A solution was urgently required. 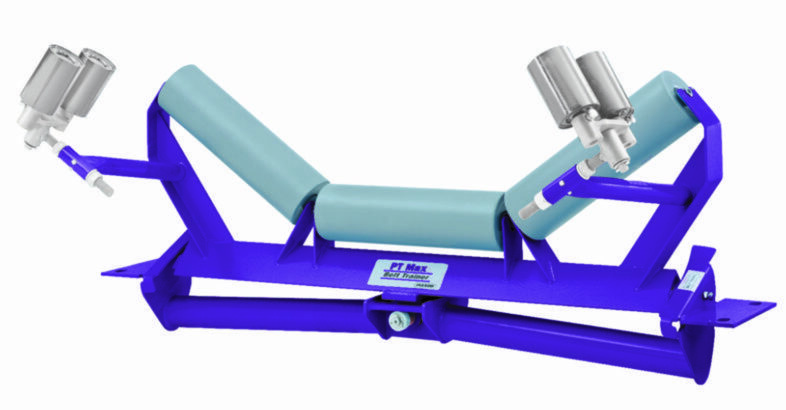 Flexco, an internationally leading specialist for mechanical conveyor belt connector systems, belt strippers, belt centring stations, impact beds and drum coatings, was charged with solving the problem. 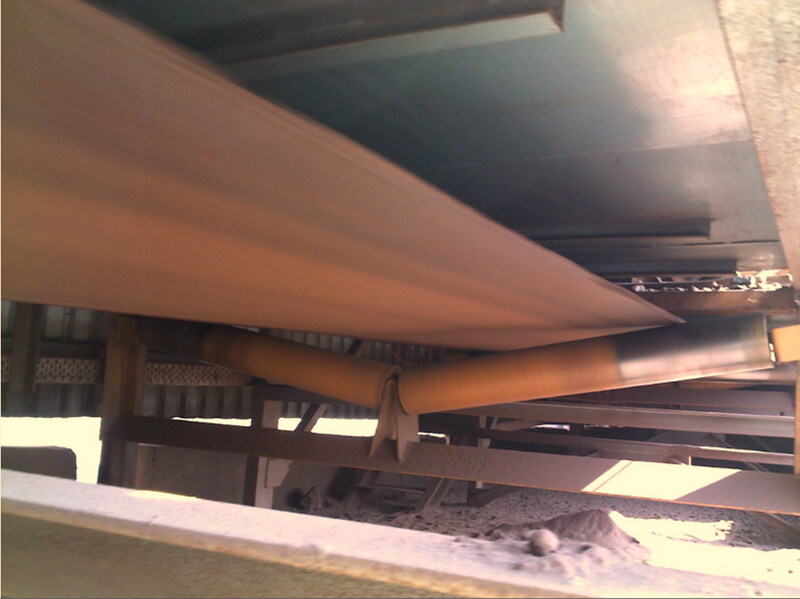 The specially trained staff identified belt misalignment along the conveyor system as the main cause of the problems which occurred. The belt was wandering from one side to the other during operation. This resulted in uneven wear. In addition, the material could fall off the belt onto the floor at the transfer and transition points. Sensor rollers detect when the belt wanders. Flexco has various belt centring systems in its range which correct the run of the conveyor belt and in doing so prevent material losses in the belt conveyor systems. In order to find the right solution, it was necessary to observe how often misalignment occurred, how the belt wore and whether the tension was low, medium or high. At the Indian steel producers, the belts are subject to high tensions and are also curved due to the weight of the bulk material. For this reason, Flexco recommended the PT Max Belt Trainer. With this centring system, sensor rollers detect when the belt wanders. The unit responds straight away to the misalignment and immediately guides the belt back onto the right track. 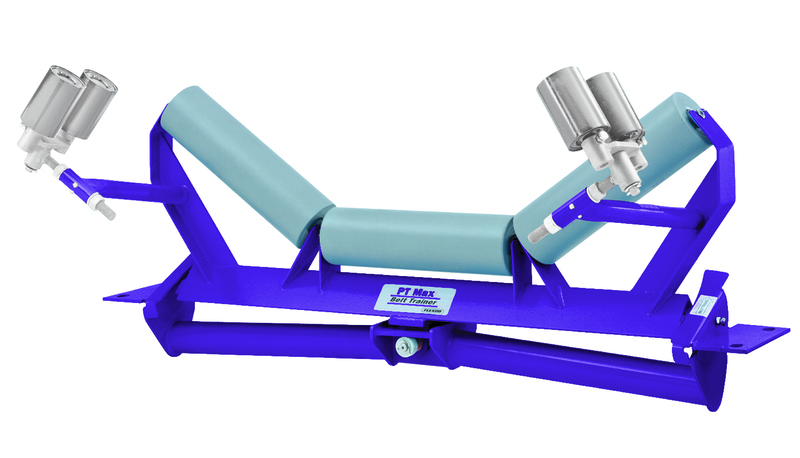 The special feature of the Flexco solution is the unique pivot and tilt movement. Pivoting affects the direction while tilting increases the tension on the incorrectly guided side. These two forces therefore move the belt quickly back to the centre. The centring system can also handle belts with worn and damaged edges as well as reversible belts. The PT Max Belt Trainer also ensures that the belt does not touch the structure, thus preventing damage and reducing maintenance costs. To ensure optimum operation, the user can fine tune the position of the centring system by means of an adjustment screw – no special tools are required. Flexco has supplied and installed a total of six belt centring systems for the return belts and four for the top belts. 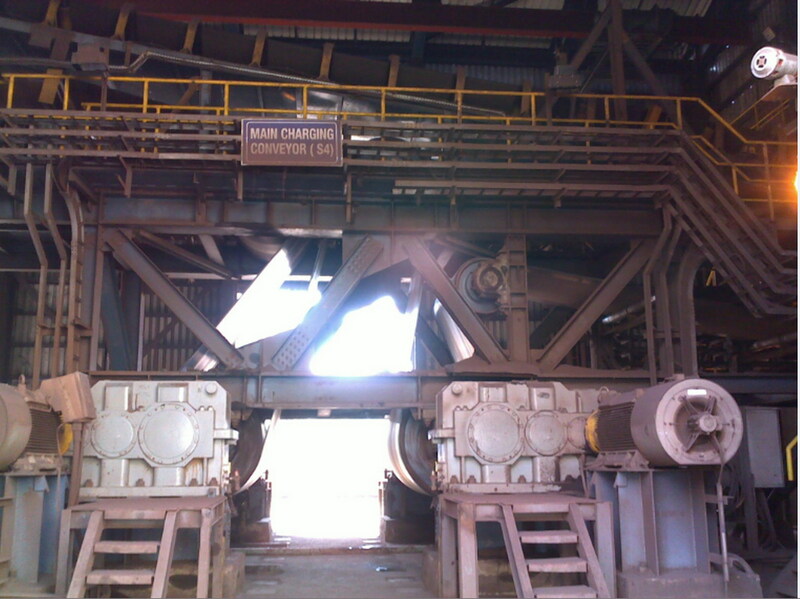 The conveyor belt transports the iron ore to the furnace. However, the belt was wandering from one side to the other during operation. This resulted in uneven wear. In addition, the material could fall off the belt onto the floor at the transfer and transition points. Once the installation was complete, the steel producer’s service personnel carried out a test run. Those responsible for the furnace were highly satisfied with the result – and still are today. The belts run consistently in the middle of the system. As a result, there is significantly less material loss and also the expensive conveyor belts need replacing less frequently. This saves the manufacturer a considerable amount of money. Maintenance is of course carried out regularly to ensure continuous, trouble-free operation. Flexco is now taking care of this. The service agreement between the two partners states that the specialists are to put the belt centring systems through their paces once a month. This includes the rollers beneath the belts, the spindles, the tilt functions and the tension rollers. These solutions have enabled the steel producer to significantly increase the overall performance of its systems – and therefore also its competitiveness. Fig. 4: With the Flexco belt centring stations, the belts run consistently in the middle of the system. As a result, there is significantly less material loss and also the expensive conveyor belts need replacing less frequently.